That's right. I, Laura Chapman, will soon be a published author. Commence the bottle popping, booty shaking and all-around total baller tomfoolery. Right now, I'm a total mix of nerves -- excitement, nervousness, euphoria, nostalgia, to name a few -- but mostly I'm glad to be able to share this news with you. 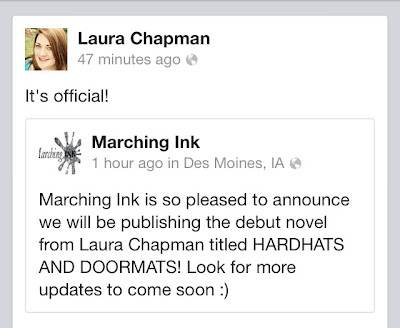 I'm thrilled to work with an awesome publisher, like Marching Ink, and happy you'll be able to read this book. Finally. I admit, I'm still in a bit of shock, but I did manage to take some moments to celebrate over the weekend with my family and a few friends. How does someone as hip as I am mark this milestone? Fortunately, I snapped some photos to document the mayhem. for some shut eye and kitten cuddles. for this year's Fantasy Football team. Sunday afternoon: Toast to "Hard Hats and Doormats"
with sparkling cider, cupcakes and my family. always be able to display my first book. Sweetest gift ever. Only bested by this wonderful card made by her daughters. Even Jane and Mr. Bingley make a cameo in the card. This has been a wonderful, whirlwind several days. Thank you to everyone for your kind words and warm wishes. This journey is just beginning, but I won't forget you for being part of it. Thank you! I'm so excited to work with you, too. woo-hoo! Congrats, Laura!! :) That is one cute card... I am digging Mr Bingley's orange stripes! Thank you for doing a critique of this book -- it helped it become better. Congratulations!!!! Can't wait to read the book! Thank you! I'm excited to read your next book, too. This is fantabulous! 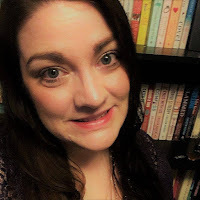 I'm actually genuinely happy for you, not fake-happy like I sometimes am for writers who get book contracts. You're so talented and funny, and I'm ready for you to take publishing by storm so I can say, "Yeah, I sort of know her. We're totally Facebook friends." CONGRATULATIONS! Looking forward to reading that book! Well you make me genuinely happy all the time. Thank you so much for your support. 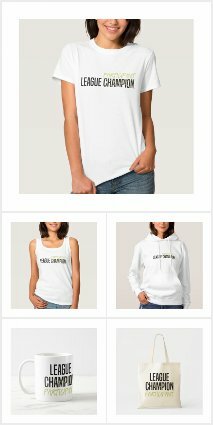 It means more than I can say.